4 What is “From Up On Poppy Hill” About? Brand Name: Ingram Entertainment Mfg#: 767685294185 Shipping Weight: 0.17 lbs Manufacturer: Genre: JAPANIMATION All music products are properly licensed and guaranteed authentic. From the legendary Studio Ghibli, creators of Spirited Away, Howl’s Moving Castle, and The Secret World of Arrietty, comes another animated triumph. Yokohama, 1963. Japan is picking itself up from the devastation of World War II and preparing to host the Olympics. The mood is one of both optimism and conflict as the young generation struggles to throw off the shackles of a troubled past. Against this backdrop of hope and change, a friendship begins to blossom between high school students Umi (Sarah Bolger) and Shun (Anton Yelchin) – but a buried secret from their past emerges to cast a shadow on the future and pull them apart. From a screenplay by Academy Award-winner Hayao Miyazaki and featuring an all-star English voice cast! From Up on Poppy Hill is a lovely Anime Film recently released on DVD by Studio Ghibli. The story was written by the legendary Hayao Miyazaki based on a graphic novel by Chizuru Takahashi and Tetsuro Sayama. Directed by Goro Miyazaki (son of Hayao), this wonderful film won the Japanese Academy Award for Best Animated Picture. But the movie is much more than just strong credentials. This heartfelt and beautifully animated film is engaging and entertaining. 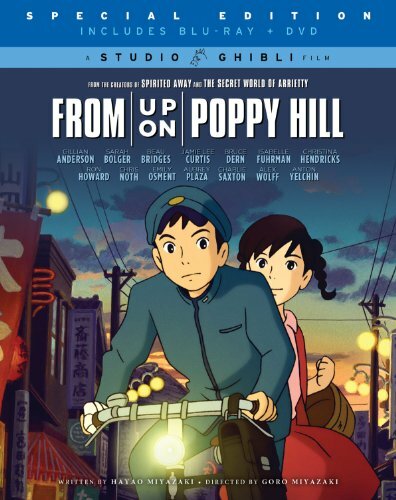 From Up on Poppy Hill is set in 1963 Japan, where a country is emerging from World War 2 destruction, by preparing to host the 1964 Olympic Games. The story follows 2 teenagers, Umi Matsazuki and Shun Kazama who are involved in trying to save their club’s tumbledown “headquarters” while the government works to clean up Yokahama by tearing down the old and broken. I love Miyazaki’s work, and both Hayao Miyazaki’s story and Goro Miyazaki’s direction shine in this lovely hand animated film. What is “From Up On Poppy Hill” About? Umi Matsuzaki is a 16 year old who lives in her Grandmothers boarding house while her mother attends medical school in the United States. She cooks, and helps take care of the boarders and her grandmother. Every day Umi raises nautical signal flags in honor of her father, who died in the Korean War. Shun Kazama is the editor of the school paper, and the author of a poem about the girl who raises the flags. He and Umi become friends. Together they work to save the newspaper clubhouse, the Latin Quarter, from the wrecking ball. It is 1963, and the Japanese government, and local businessmen, are trying to replace the old and dilapidated with the new and modern to show the world that Japan has recovered from World War 2. The story is lovely, the animation is extraordinary. This award winning film is one you should not miss.